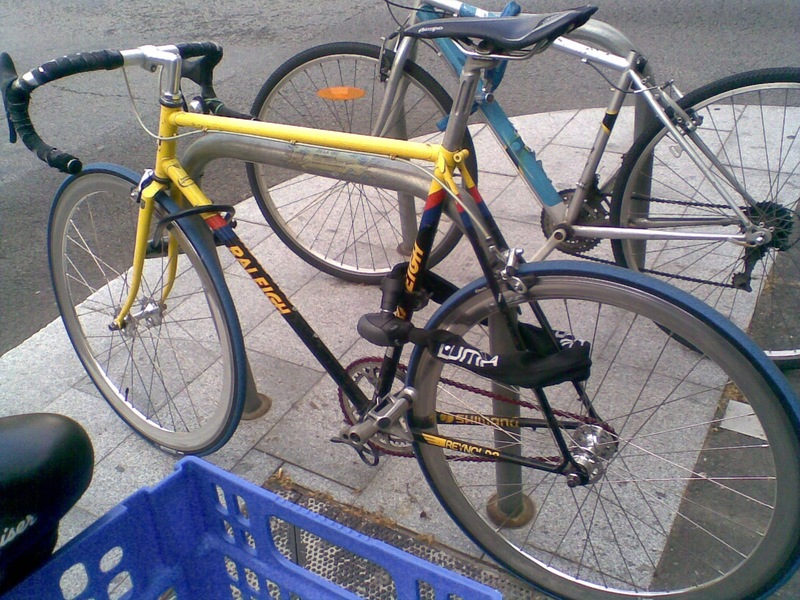 This Raleigh was locked next to my apartment in Barcelona. According to the Wikipedia article, Raleigh, which is based in Nottingham, UK, is one of the oldest bicycle manufactures in the world. If you are a professor at University reading this, I know that you are thinking about how unreliable my source is. But hey: focus on the bicycle. What a bicycle this is!! I don’t recall seeing any other Raleighs in Barcelona, so it was a nice find. And I fell in love with this one instantly. First, the yellow, blue and red frame. Amazing frame. Second, the red chain and lastly the blue tires. All matching, of course. I want it!! PS: DIDN’T you know what an alleycat was??? I never really looked it up but I’m guessing Barcelona’s race was something like that, with obstacles and different kind of stuff you needed to do in order to get points.